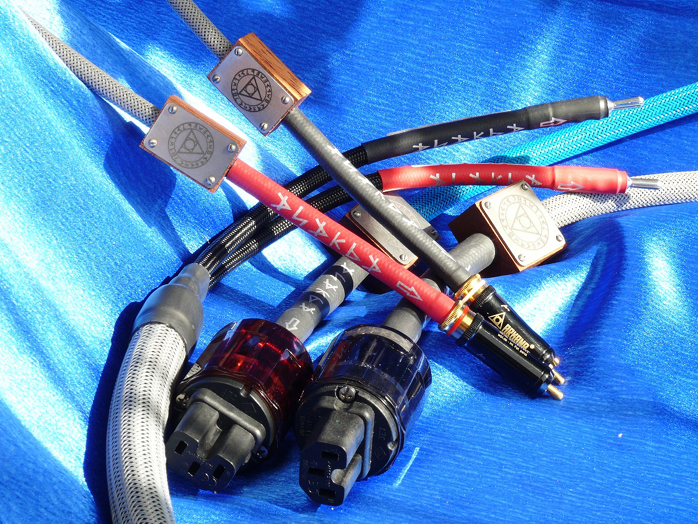 Cables: Audio Art SE and Classic cable looms, JPS Labs Ultraconductor 2 speaker cables, Madison Audio Lab E3 Extreme 1 Interconnects/Extreme 2 speaker cables, Signal Cable Silver Reference interconnects and speaker cables, digital optical and coax cable, DH Lab Power Plus AC cable. Are rare earth metals the new frontier of wire technology? It’s unusual to see pioneering status claims in the field of audio cable materials in this day and age. Whilst the wire industry has become exotic and expensive over the last 40 years, the primary ingredients have with rare exception amounted to refinements of the usual suspects – copper, silver and related alloys. Purified, drawn, single crystal, elaborately wound, they have held court in numerous permutations and on various fiscal plateaus. Now an upstart young American company ask us to consider the possibility that the days of copper and silver conductors have come to an end. Welcome to the brave new world of Arkana Physical Research. They started in 2012 as a group of audiophile physicists in Hot Springs Arkansas. Based on theoretical and practical research they have chosen to champion rare earth metals. The company wraps itself in an intriguing cloak of secrecy, partly due to looming patents, partly as a dash of intentional mystique. The metals remain unnamed. The band of physicists prefers to remain anonymous. Arkana practice not just dry physics but also dabble in a touch of artful playfulness mixed with a nod to alchemy. To quote the designers: "The ‘Arkana’ project is not just pure physics, it also borrows from alchemy. All our Arkana stylings hint at an esoteric part of our research. The company logo is a squaring of the circle as the alchemical symbol of the sorcerer's stone. The circular text is written in Phoenician letters, the cable model names are Latin translations of the Tarot's major Arcana trumps. Even the colors of the braids were not chosen by chance as they are the colours of the four elements - earth, water, air and fire." The alchemy subtext is imaginative but doesn’t address the obvious question. Why rare earth metals? What are the benefits? According to the website, "the Arkana metals are distinguished by their stable properties across a wide bandwidth which can reach 10GHz. A drastic reduction of skin effect influence and extremely low values of per unit lengths for capacity and inductance of selected metals cause an absence of the phase shifts typical for conventional materials. This minimizes group delay in Arkana cables. The combination of the above properties provides a coherent and perfectly linear character of musical signal transmission. Galvanic cleaning, annealing and polishing of the conductors surface as well as stabilization of their crystal structure made it possible for us to fix and even strengthen the above mentioned unique properties. The Arkana cables are mono cores of different rare metals of the highest purity with carefully dimensioned cross section. High-quality Teflon is applied as insulation material with a minimal dielectric permittivity factor." That information was suitably dry for engineering heads so I e-mailed the designers to dig a little deeper. Q: You have several tiers differentiated by pricing and a colour convention. Are the colours relevant to the materials used and do they utilize the same metals? A: Different metals, different characteristics and consequently different sound. As for colours, they are a marketing need to divide the metals from each other without revealing their chemical identities. They all have the same type of crystal lattice but different density, resistivity and degree of the skin effect which affects the phase and frequency components of the signal. At the same time, conventionally used metals (copper, silver and gold) also have a shared type of crystalline lattice but of a completely different structure. During our research we identified a number of metals with mutual sound characteristics but not all of them may be applied for one single cable. A lot of time was spent to find good-sounding designs for cable connectors. The difference in sound depends not only on the selected metal but largely on its compatibility with the specific form of its chosen connector. For this reason we made and listened to hundreds of samples. 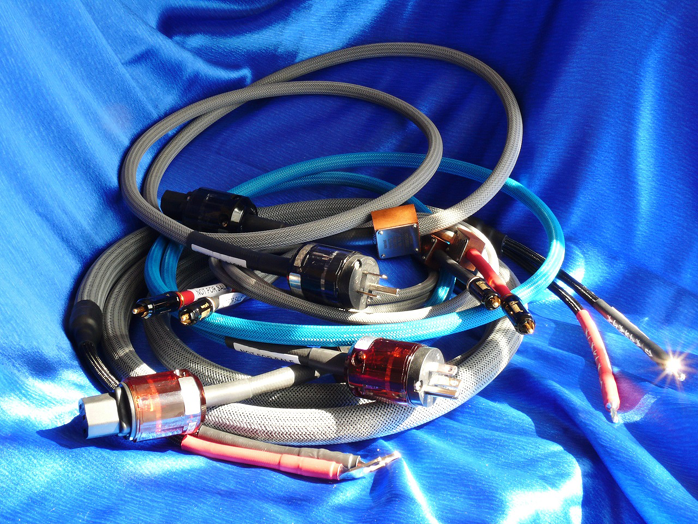 All our cable ranges were designed for a specified price level and to match various components of similar pricing. Hence our top cables have higher resolution and linearity which is typical also for equivalent components. Q: Are the cables based on alloys with conventional metals or pure rare earth metals? A: We are talking about solid rare metals of maximum achievable purity – 99.99%. Q: Have these metals been applied to audio use before? Are you repurposing existing materials? A: The metals (chemical elements) we use are the most common in the electronic industry and for electronic components but nobody has used them as hifi conductors before. After several years of research and evaluation, we managed to discover perfect phase linearity for conductors made from those metals. The key factors are: low linear inductance and low linear capacitance combined with the best connectors available on the market. Q: Without compromising your IP and pending patent, can you divulge more about the materials? A: Any information about the actual chemical elements is still a secret whilst the procedure of obtaining a US patent is in progress. We can assure our consumers that all our chemical elements are fully safe to use in signal and power circuits. None of the following rare earth elements are used - Scandium 21, Lanthanum 57, Cerium 58, Praseodym 59, Neodym 60, Promethium 61, Samarium 62, Europeum 63, Yttrium 39, Gadolinium 64, Terbium 65, Dysprosium 66, Holmium 67, Erbium 68, Thulium 69, Ytterbium 70 and Lutetium 71. Moreover, some of our metals are used in medicine. Q: Do Arkana make the cable in house or are they subcontracted to specs? How deeply involved in actual production do you get? Is yours a full-scale production facility? A: Every Arkana cable is handmade in our workshop, some operations like the Teflon extrusions are carried out on special equipment located in the same place. All the raw metals are from suppliers which produce them according to our specs. So it is in fact a full-scale facility, just not large in size. And so begins our journey. The cables arrived in a small postal shipping container bereft of their normal consumer boxware and sleeves, garbed instead in foam wrap layers. The individual cables were protected by polystyrene tubes around the AC connectors and plastic mesh for the small Arkana logo boxes on the interconnects. Plastic tie wraps created pairing. The cables are premium in appearance and of the requisite termination caliber for their asking price. 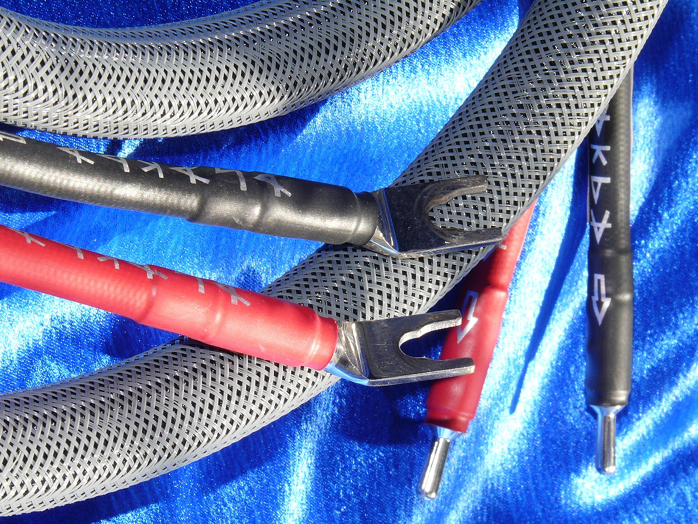 The standard Exquisotor is described as a gray metal conductor, insulation is Teflon in a gray PTFE braid jacket and connectors are WBT 0102CU RCA or Oyaide Focus 1 XLRS. 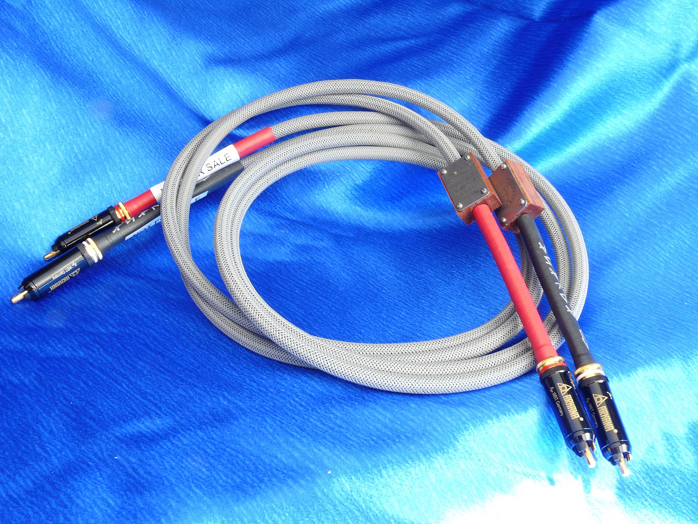 An SE version claims further enhancements and Furutech CF-102R RCA connections. The Aequilibrium speaker cables are likewise gray metal based, Teflon insulated and finished in a matching gray mesh. The main body of the Oyaide SRBN bananas is trimmed from an 8mm phosphor bronze bar, then its insertion part is slit crosswise to ensure maximum contact area. The body is completed with silver inner and rhodium outer plating. The SPSL spades are RoHS compliant pure brass with a combination of silver and platinum plate.